During the early period of Bangkok the bond between people and water was so strong that most of transportation and trade was done on canals or Klongs. Water was part most of the activities necessary to everyday life. Commuting was done thanks to the canals and houses where on their banks. When the first motor vehicle was introduced to Bangkok about a hundred years ago, the first road was then built, then another road, another road and another road. Canals were filled to build roads, some became housing projects. Bangkok has had fewer and fewer canal and smaller water way ever since. Boats were substituted by cars and trucks. The bond between people and water become less important. This made Bangkok what you see today. Our bike tour in Bangkok is a bit like a time machine, taking you back to the time when Bangkok people and water were bound together. Cycling through old communities, observe the local culture and way of life surrounded by lush green orchard. Lunch break will be at Taling Chan floating market, one of the most renowned floating markets in Bangkok. 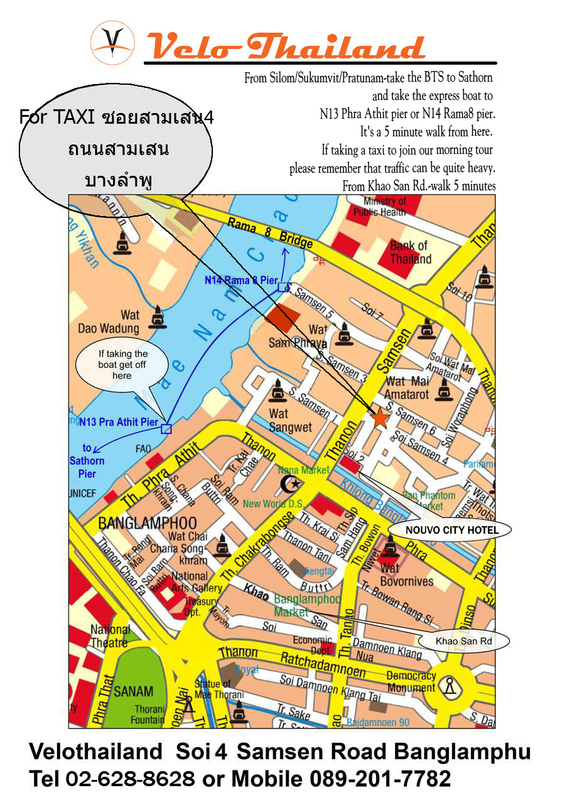 After lunch we will feel the cool breeze along canal and river in the long-tailed boat and view another perspective of Bangkok from the middle of the river before making the last bit of cycling and end our trip at the starting point. The tour usually takes about 5-6 hours. but this may vary by group. You should arrive back at the shop before 3 pm. We cycle about 30 km on flat, quiet city roads, Riding the quiet 'sois' and lanes ,sidewalks on canals, dirt tracks along very minor roads, pathways, through alleys, temples, gardens and coconut plantations. All is flat. Some of the canal paths are elevated and quite narrow and we advise caution on these sections but otherwise it is a nice and easy ride. Anyone who can ride a bike will enjoy this ride. we use imported 24-27 speed Trek, Giant or GT mountain bikes.